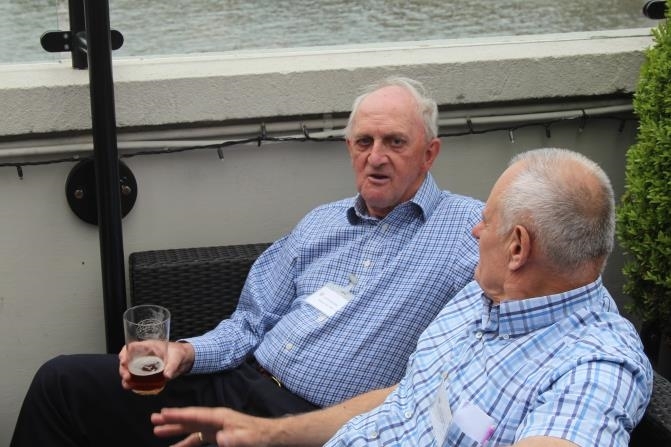 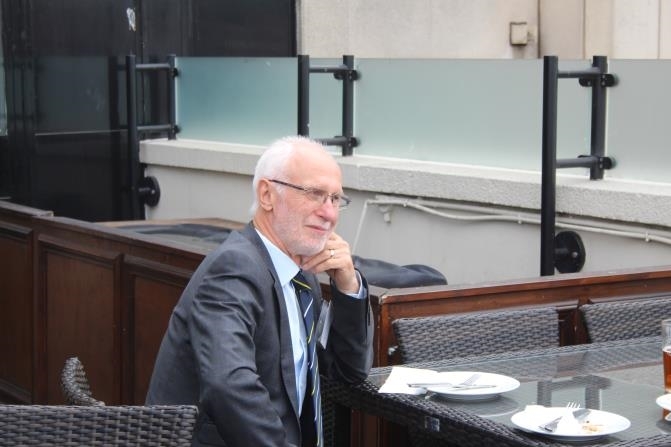 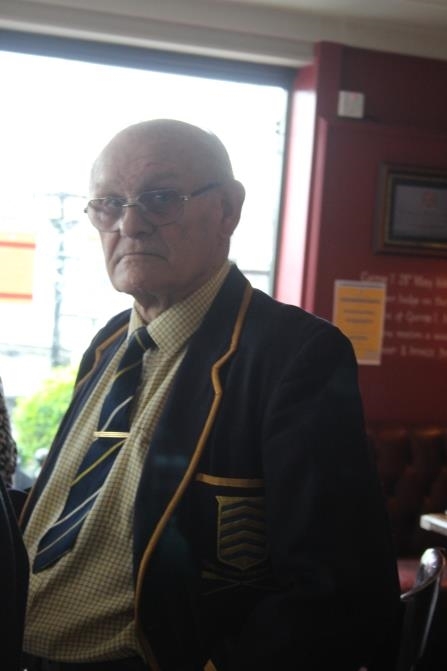 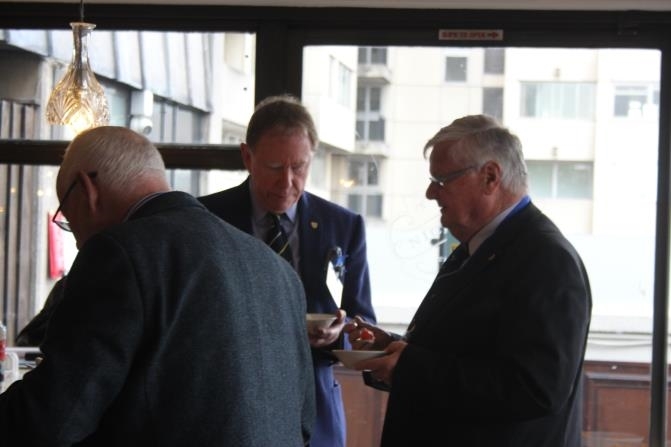 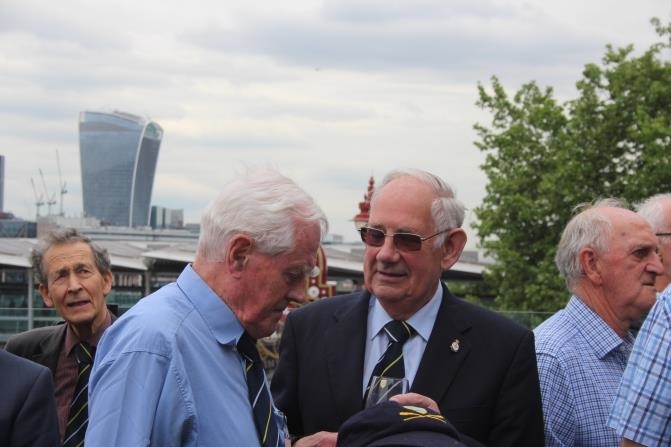 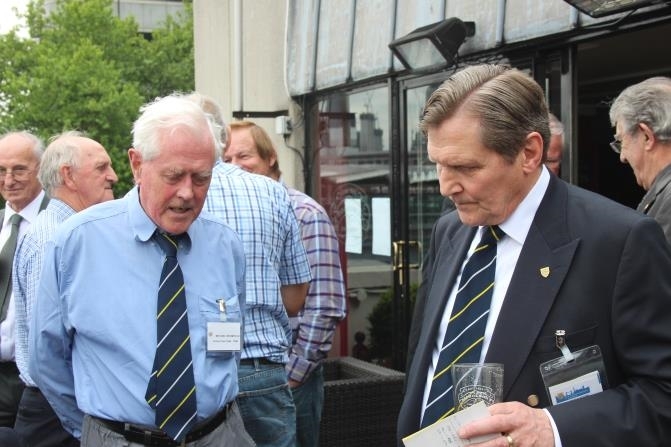 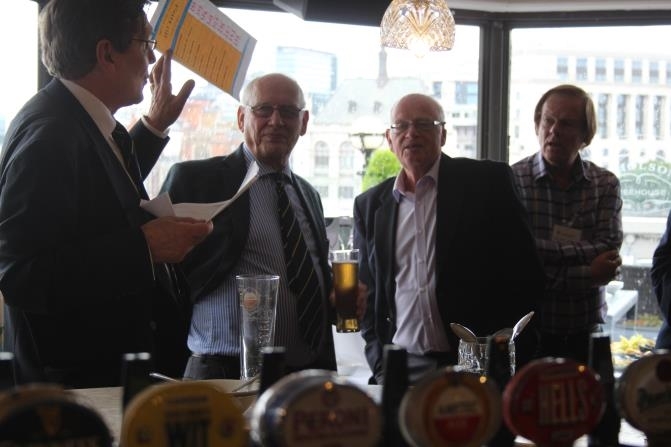 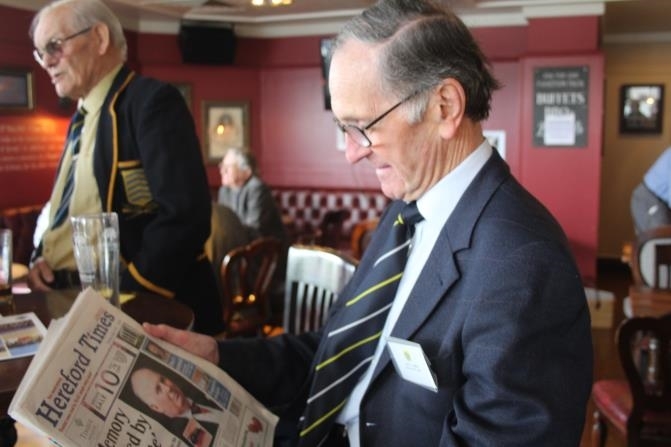 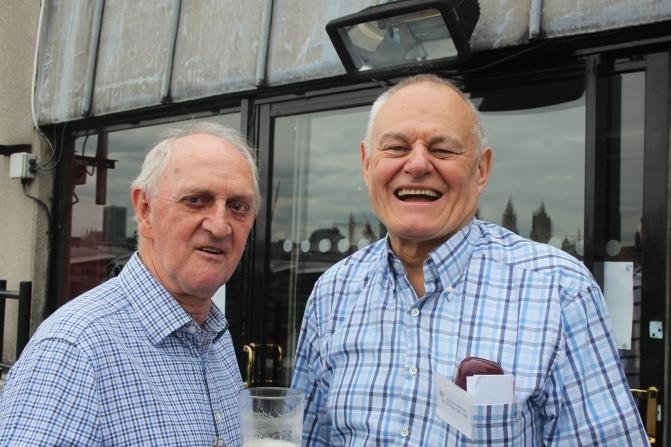 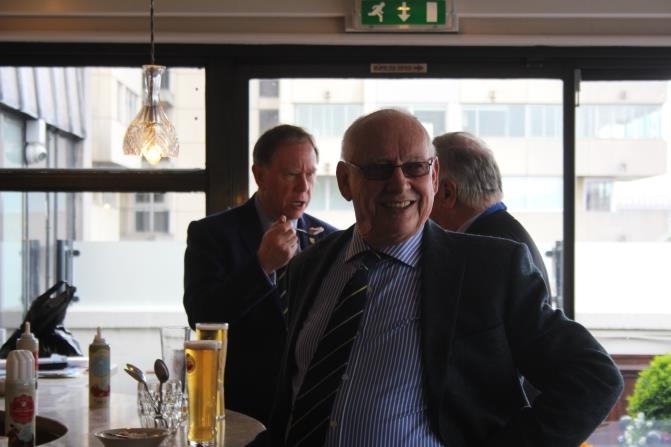 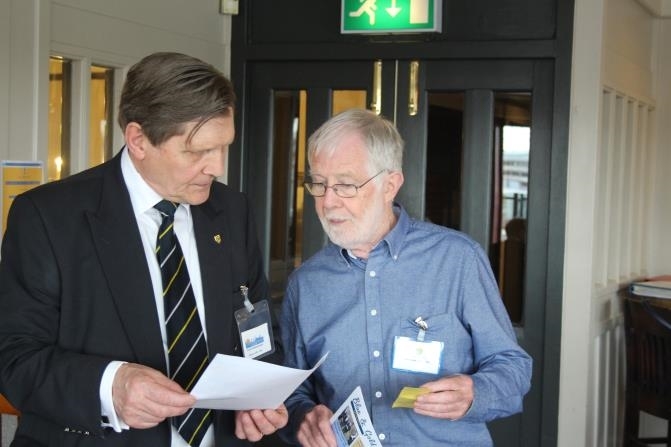 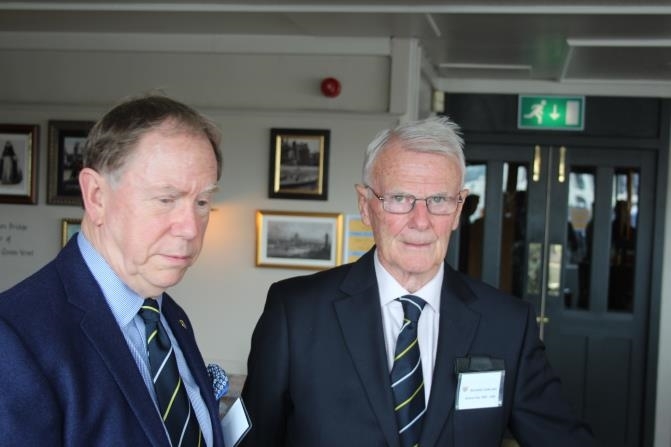 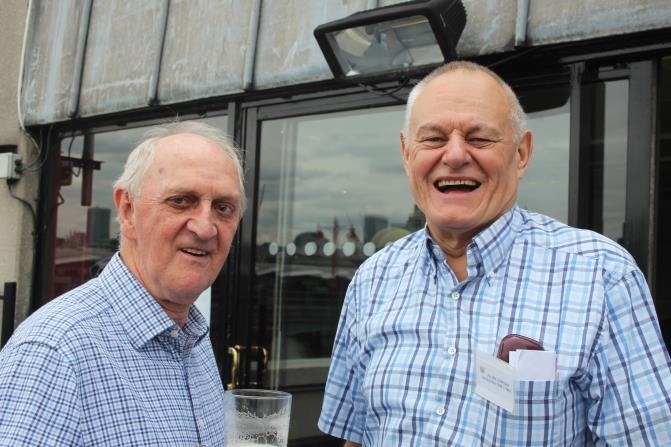 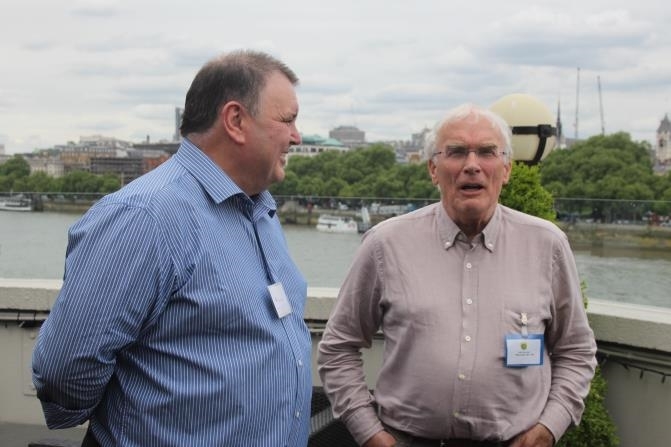 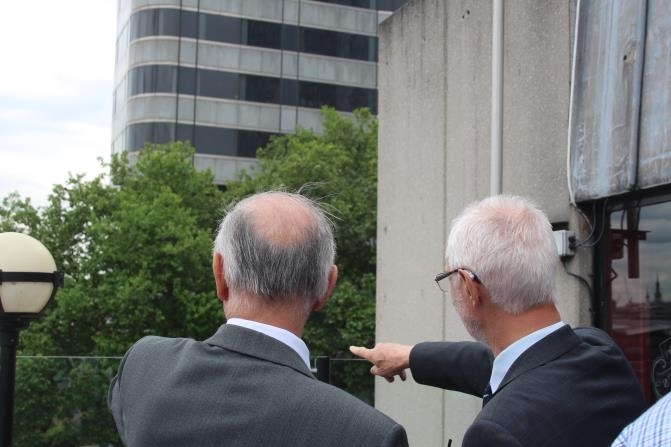 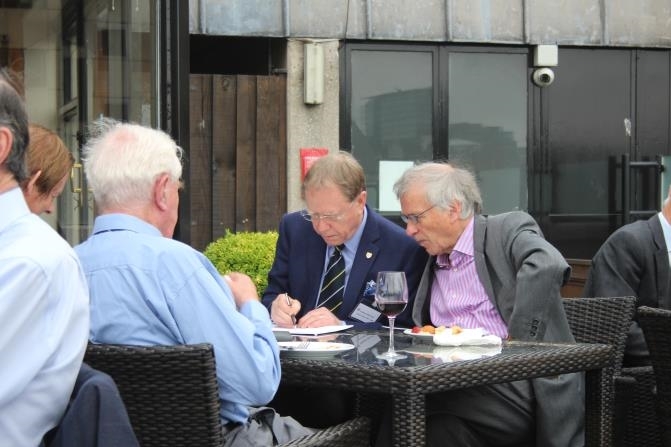 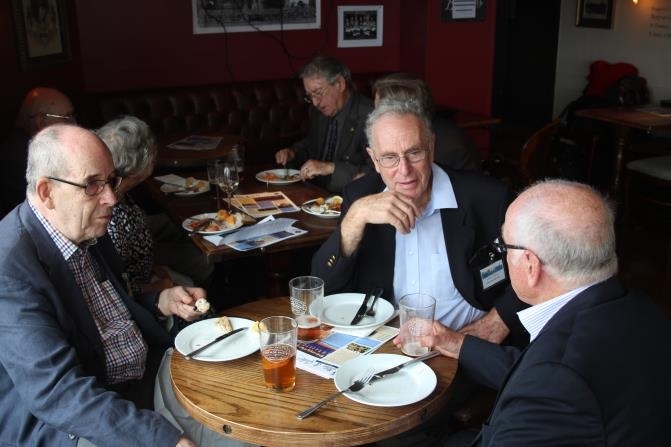 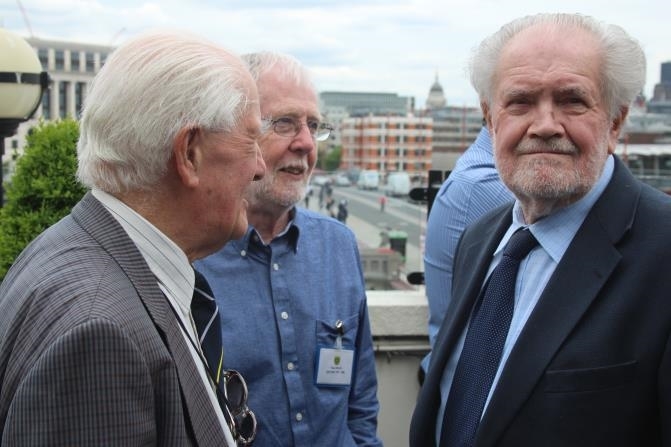 Among 30 OHs present at this event was David Prosser ** who was a boarder in Deanery between 1946 – 1952. 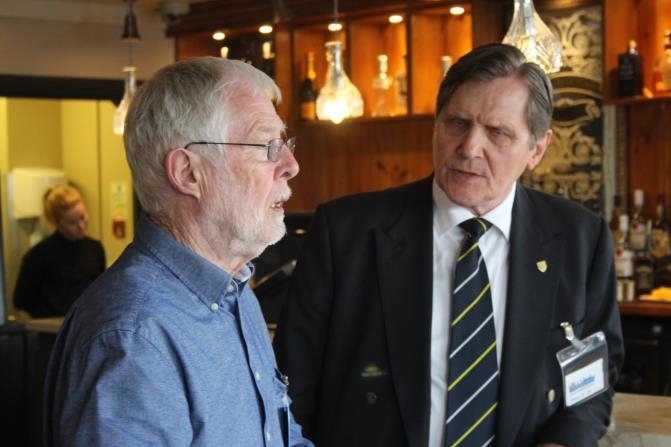 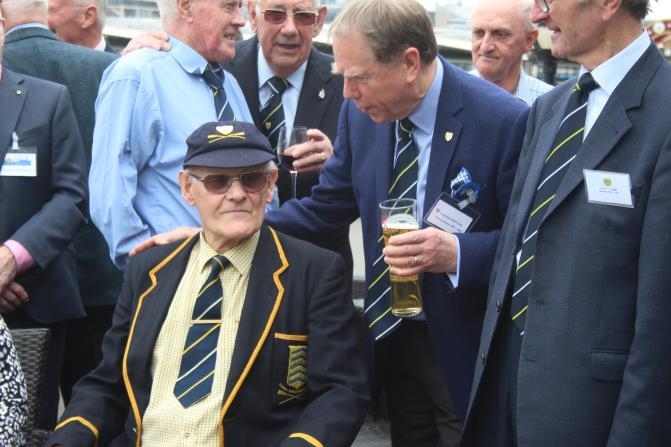 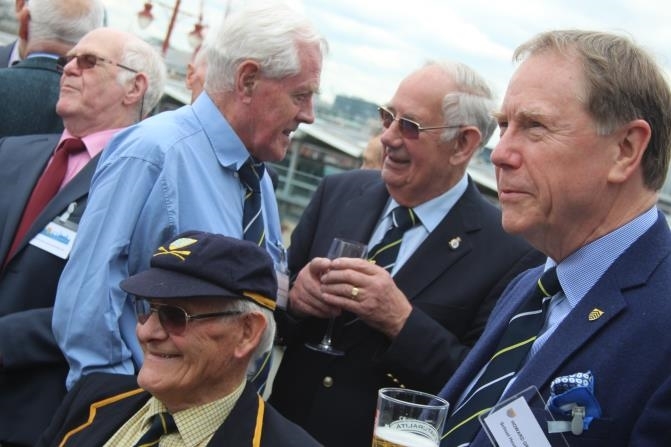 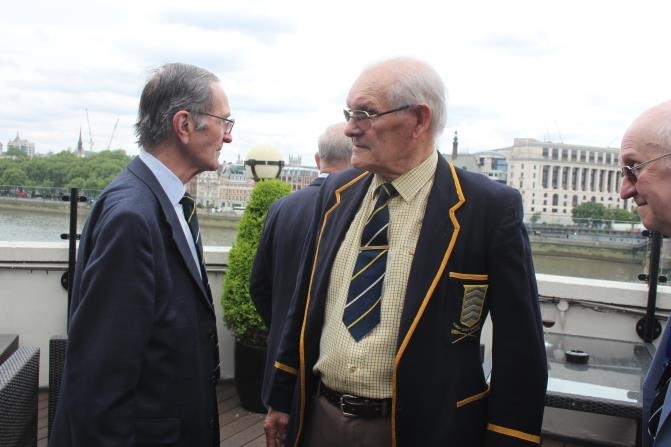 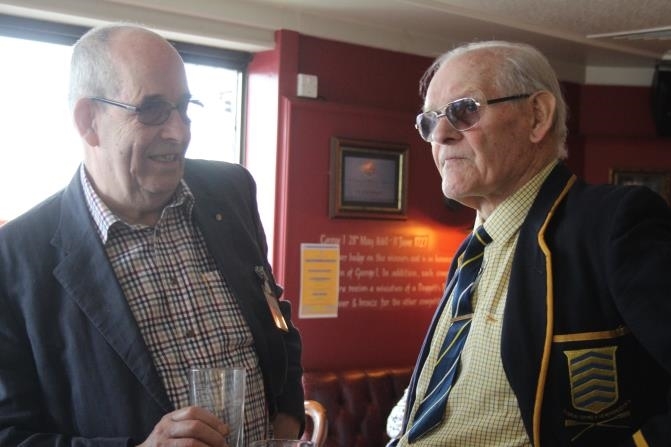 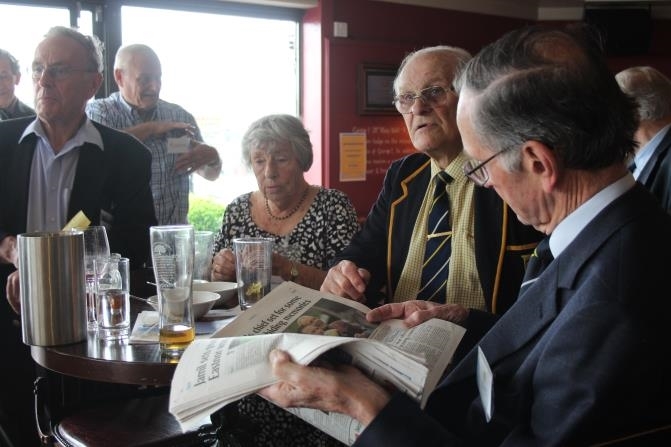 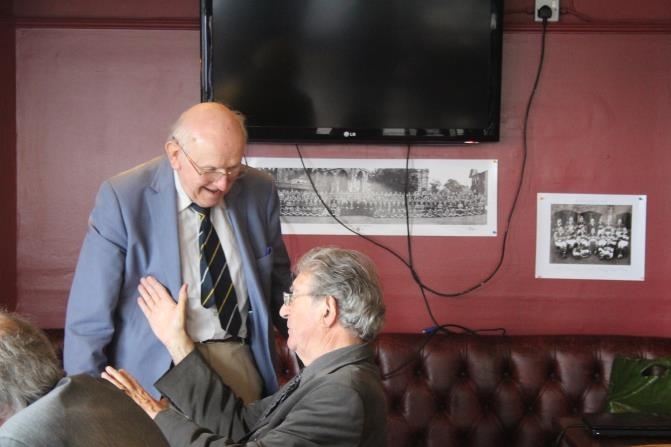 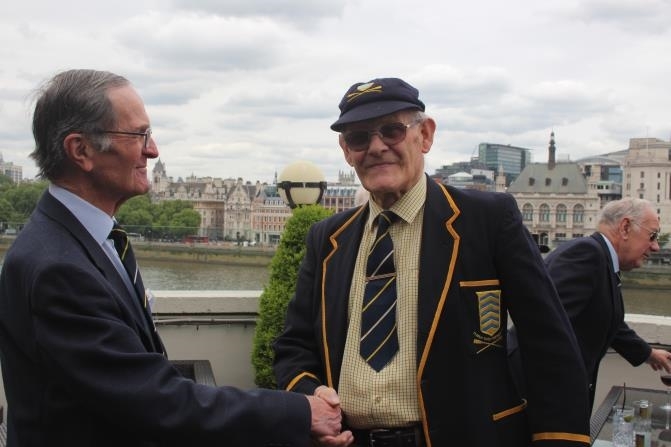 Known as dai to his contemporaries, he is featured here being congratulated for his rowing skills some 60+ years later by John (jesse) James, another Welshman and fellow Deanery resident. 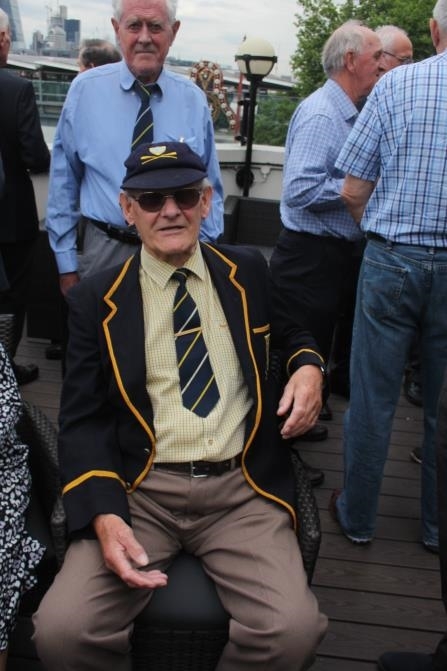 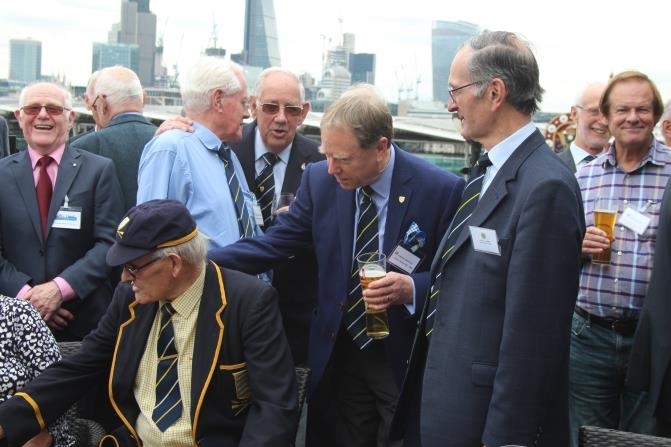 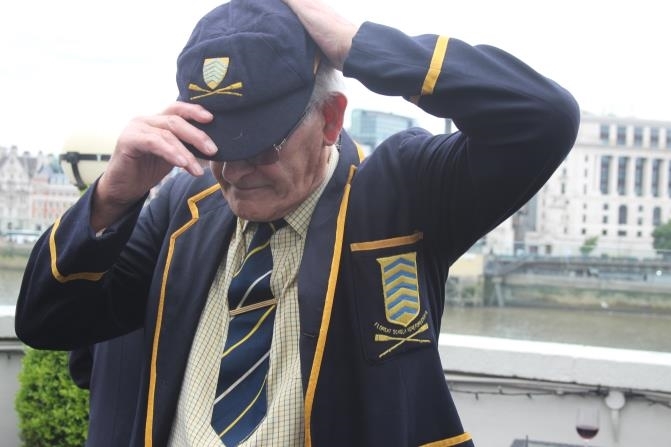 As can be seen, he brought along his emblazoned and still highly colourful blazer & cap to show us, complete with full rowing colours awarded to him in his final year at HCS. 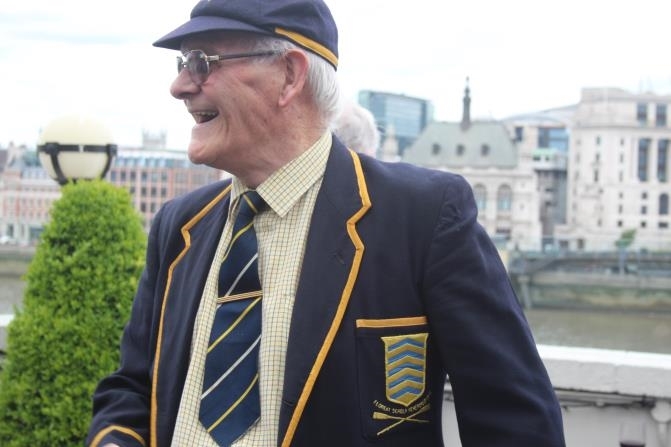 Although slightly tight around the waist, we all agreed that it was remarkable David was still able to wear the garment after all these years! 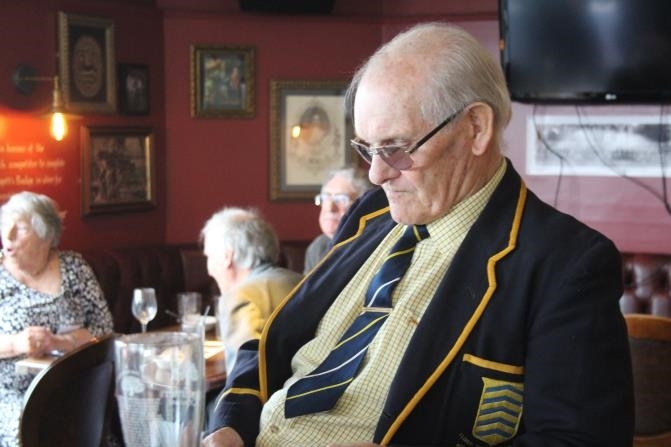 His blazer is in (almost) pristine condition, showing little sign of age or the yellow braid having faded. 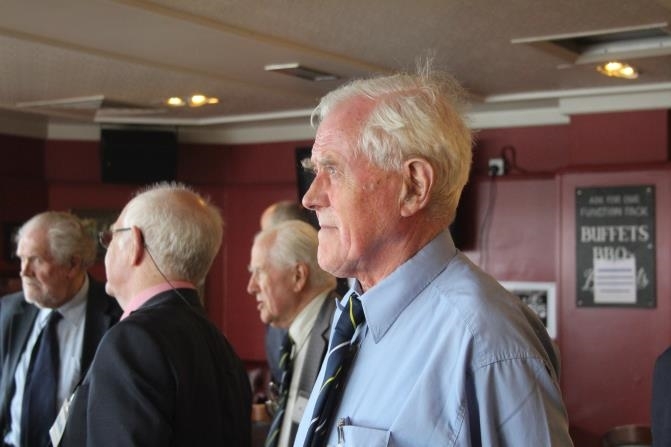 Could we smell mothballs? 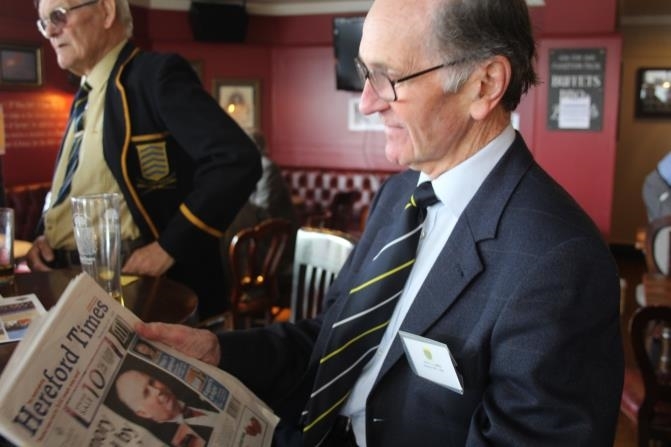 Joining us again this spring was Mrs Patricia Brittain (née Hopewell) being the daughter of former Headmaster A.F.J. 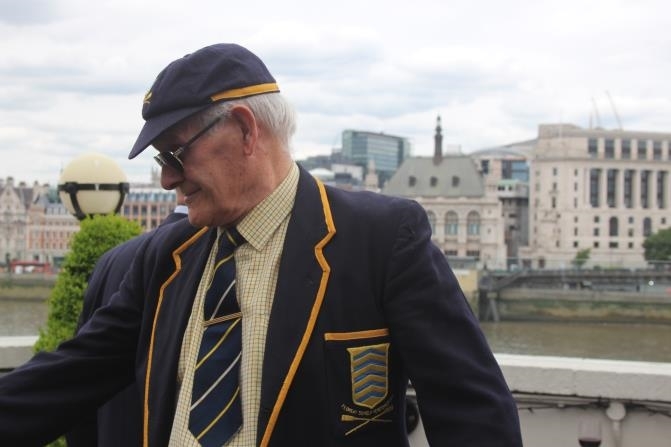 (Jack) Hopewell who was himself an Old Herefordian (1908 – 1911) Trish, as she was affectionately known to the boys in School House, used to sit next to her father holding her dog Trigger whenever House photographs were taken outside No.1. 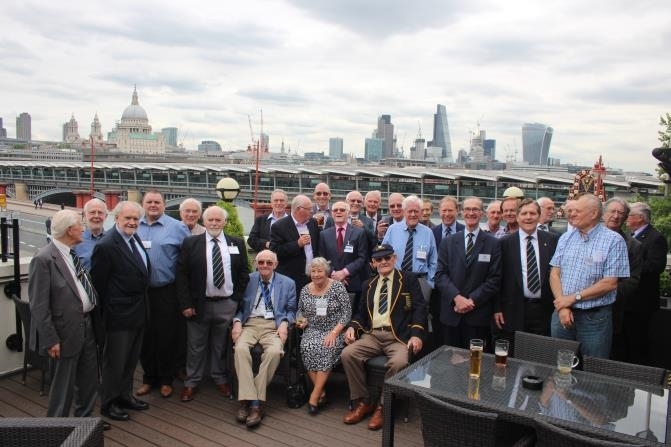 Most of the members attending the reunion came from London and the Home Counties, However, several had travelled in to Town from the Midlands, from East Anglia, the West Country and Herefordshire, including guests Mrs Claire Morgan-Jones (HCS Development Director) and Mrs Helen Pearson (OH Alumni Officer) both based at the School. 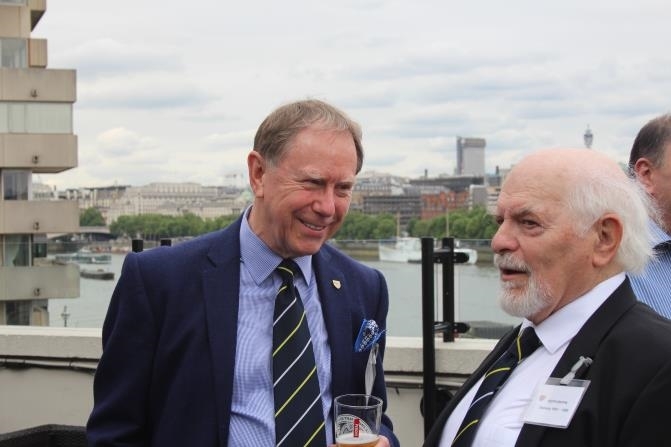 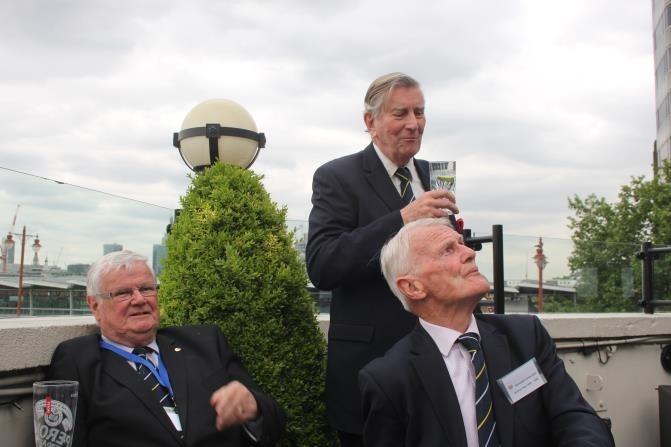 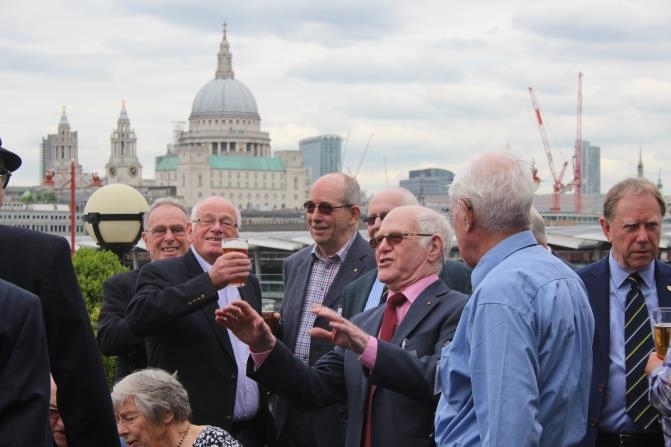 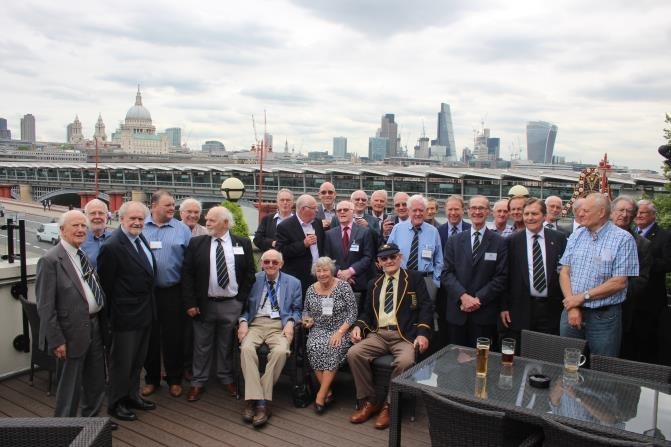 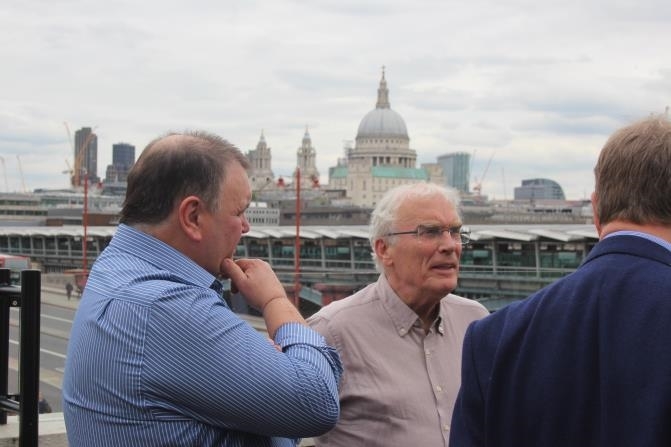 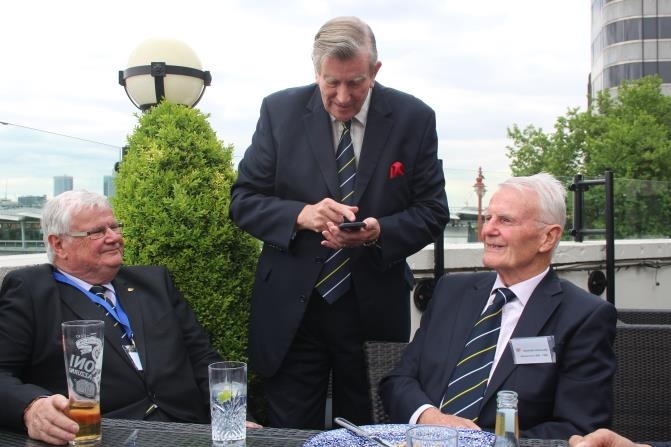 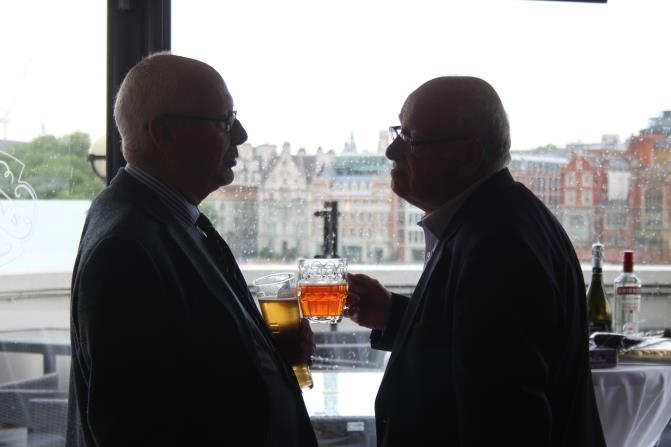 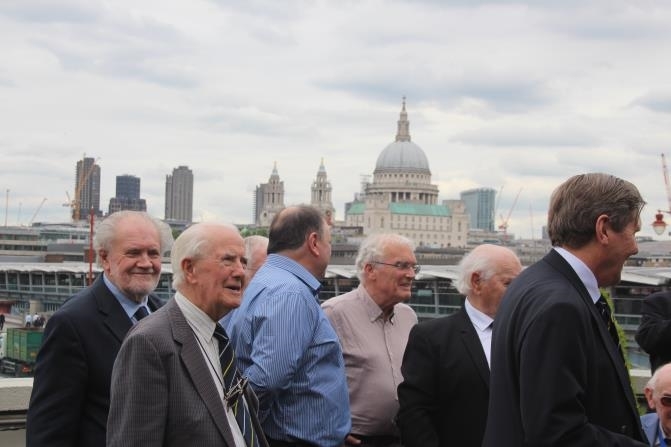 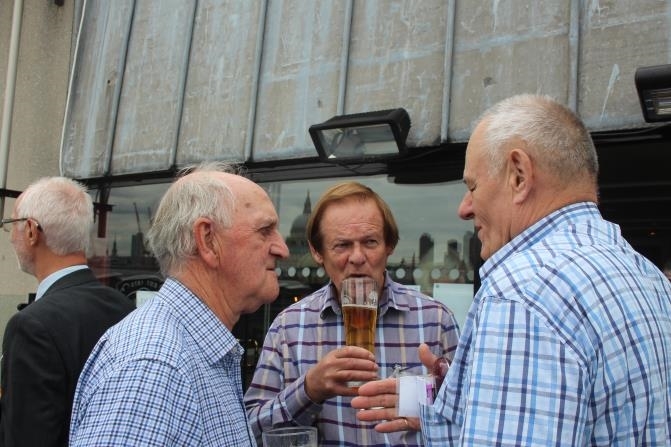 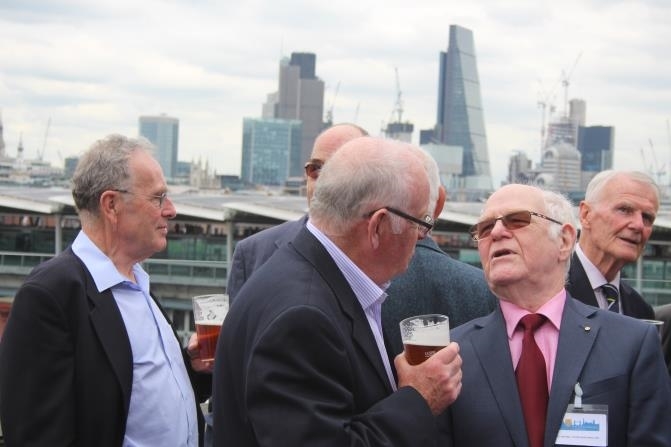 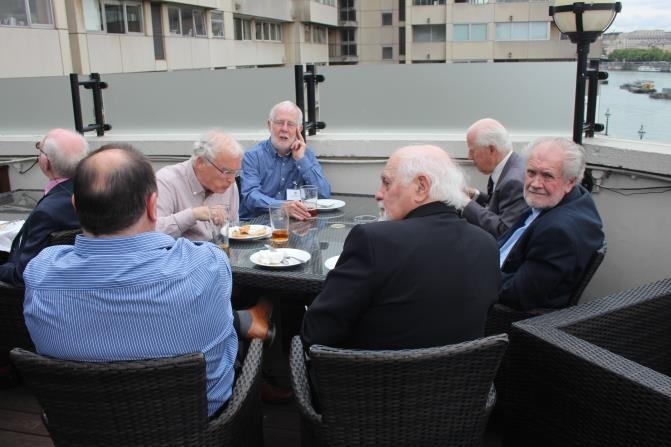 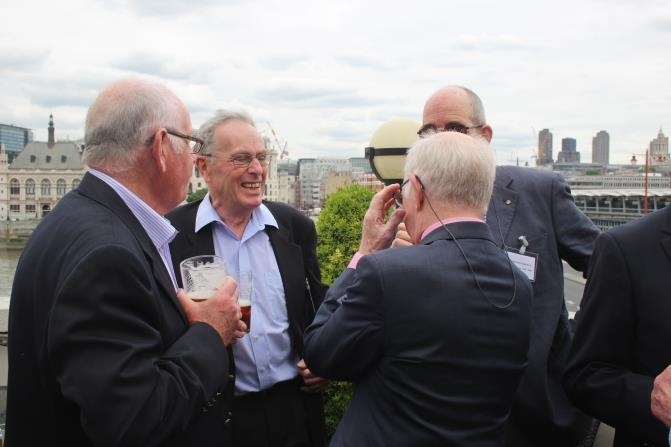 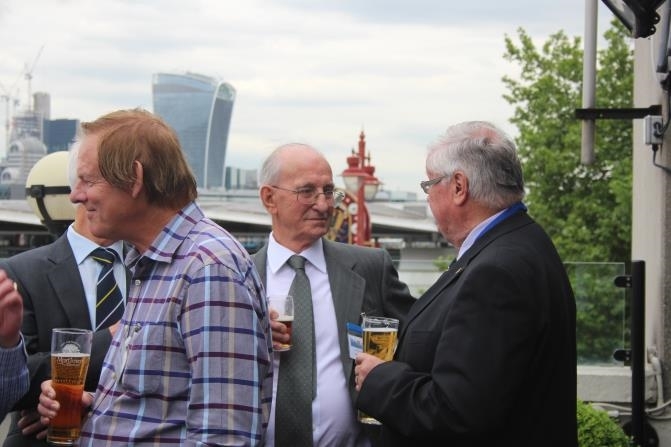 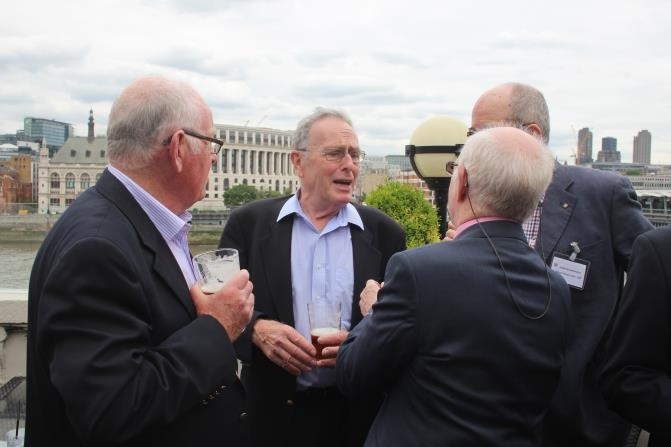 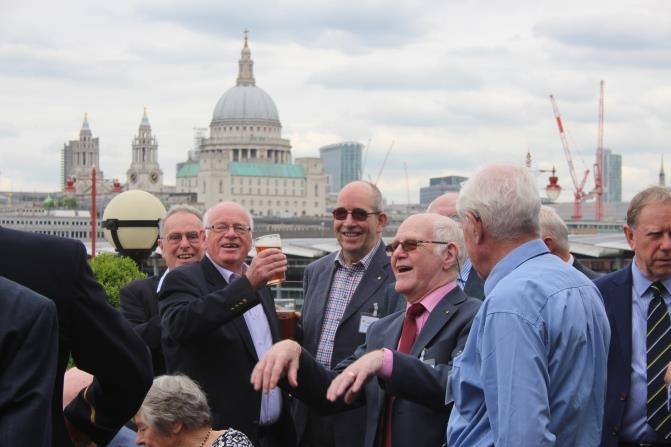 Members were able to enjoy views across the river to St. Paul’s Cathedral and beyond as they ate their meal outside on the open-air balcony.